I doubt I am alone in associating the Pals battalions mainly with the 1st July 1916 and the effect of that day on the local communities that they came from. Yet their role in the war was of course much greater than this. Accrington not only raised a whole infantry battalion, but also rose to the challenge of forming an Artillery Brigade as well. In this new history Andrew Jackson looks to set the record straight with a comprehensive account of the war records of both units. Building on the success of his website and drawing on over 30 years of research, Jackson provides an in-depth account of both units, utilising war diaries, local newspapers and a host of other sources. 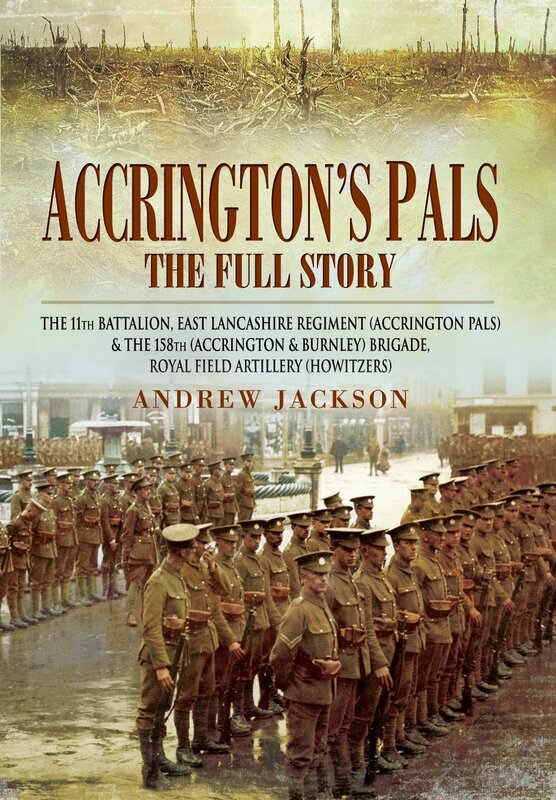 From the conception and formation of the units, to their training and deployment, the sources (including many letters home and accounts written by the men) are used to great effect to paint a rich and detailed picture of the Accrington units and the men who were part of them. The account of the Pals’ attack on Serre is covered in detail from both sides of the wire, and supported by illuminating first-hand accounts of the action. Out of 700 men who went into the attack, only 116 were able to answer the roll call afterwards. The battalion had to be completely reorganised; for a time it formed part of a composite battalion until it could field enough men to hold the trenches on its own, and did not reach full strength again until early 1917. Although replaced by men from further afield it would not lose its Accrington identity. After a relative quiet period during the winter of 1917-18 and the early months of 1918, the battalion were rushed in to shore up the line following the German onslaught of the March offensive. On 27th March Lieutenant Horsfall was killed in action during the defence of Ayette, and was awarded the Victoria Cross for his actions; overall the battalion lost 350 men that day. The Howitzer Brigade did not have a quiet war either. They suffered casualties during the Somme campaign, and saw action at Arras and Ypres. I was even able to make a personal connection to my Great Great Uncle’s story from reading the book – the Brigade provided artillery support for the attack at Westrozebeke on 2nd December 1917 in which he was killed. Accompanying photos are numerous and include many named pictures of men referred to in the text, further helping to personalise the account. Several maps are also included, relating to some of the key actions they fought in. Jackson also dwells on the legacy of the Pals’ battalions and particularly the impact of the Somme. ‘Selective’ remembrance began almost immediately although the local memorial recognises all the dead from the town (not just the Pals). The memorial at Serre (unveiled in 1991) further cemented the legacy. The centenary of the Somme in 1916 will doubtless see a great deal of focus on the Pals’ battalions, and this book sets the standard for well-researched and insightful examination of the role that they played not only in that campaign but also the war overall.